My mom gave me the greatest gift ever; spending time with me in the kitchen letting me help her. Sharing not only her knowledge of cooking, but her wisdom as well. Some of the best times I've ever had with my girls have been in the kitchen with them at my side. They've been there by my side since they were tiny and even though they are teens now, they still like to help me in the kitchen. As soon as they were big enough to climb on a chair they wanted in on the action! I am eternally grateful for this gift, and hope I passed it on to my girls and that they share it with their children one day. I wanted to share with you a recipe that is perfect for letting your children help you in the kitchen. Give them a mixing spoon and let them go to town. In a mixing bowl add mashed bananas, pineapple, orange juice, zest, flour, granulated sugar, baking powder, baking soda, salt, melted butter, eggs and almonds. Stir till combined. Spray a 24-cup mini muffin pan well with no-stick spray. Fill with batter. Sprinkle tops of muffins with turbinado sugar. Even a very young child can do this step; they might just want to sneak a taste though. Bake in 350 degree F oven for 10-14 minutes. lovely muffins- bookmarked this one! Nicely done Gina!! I keep forgetting to do one of these posts... maybe today! LOVE these muffins! I'm dreaming of warm tropics now and these fit the bill! Wow Miss Gina! Look at you go! These are just gorgeous muffins! Great post; beautiful muffins. I didn't have any daughters but 4 sons and they all enjoyed being my sous chefs; Happy to say these men love cooking and their wives are very happy. Yum, yum, yum! The muffins look so good. I love cooking with Dudette, although it changes the whole experience from one of relaxation and contemplation to one of patience and restrained fear (she always gets too close to the hot stuff). What great looking muffins. I love all of the citrus! These sound delicious! The pineapple makes me think of warm, sunny days too...love it! These muffins sound so good and healthy, with all of the citrus and the banana. I'm bookmarking these. I have a lot of oranges and bananas, and lefftover crushed pineapple from the carrot cake I made. Gina you've made more ray of sunshine muffins, guaranteed to cheer me up:) I love that cooking has been part of your family, that is so special. Your girls are so adorable and gorgeous,the little one looks just like you:) Thanks for sharing your recipe and this great cause. Gina, I'm glad you are participating to this event too! And great muffins! I am making muffins with Carla today too. I will have to try these ones too! Hello deliciousness! :) These muffins are so yummy - I love all those flavors fused together...mmmmm! What a great post GIna! And your daughters are so cute! Lovin the muffins! What a great post Gina. Love the photo and these muffins make me dream of summer sunny days. Great recipe for a great cause. What a great combo - I love all these fruits and I bet the muffins came together beautifully! Muffins looks cute and full of flavors. Like the citrus punch in them. Your daughters are too cute!! Love this campaign, because I love my little ons in the kitchen with me as well! I can smell the lovely aroma from the muffins- gorgeous!! Love those fruity muffins! That little gal on the stool looks so much like you! What a great combination of fruits and I love the sugar topping. this looks so yummy... perfect flavor combo ever!! i love this thanks for sharing this. You have two beautiful girls! I love the muffins. Muffins are the best way to start the day as far as I'm concerned. This post warmed my heart. This is what cooking/baking is all about! I love the flavor combination, and I love the cause that this recipe supports. Thank you for sharing, sweet friend. May the middle of your week be full of joy and laughter. I was raised in the kitchen myself, by both my mom and grandma. 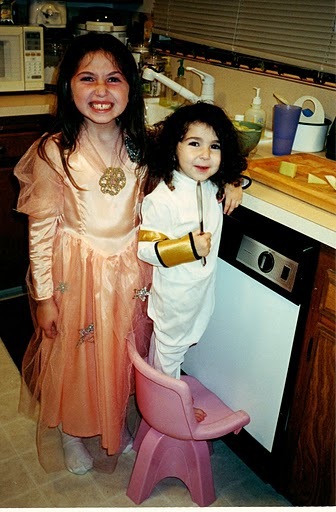 My two kids have also been having fun cooking in the kitchen with me since they were little. Hopefully they'll carry on with the tradition. It's great that people are realizing how good it is to cook and eat healthy food. LOVE your very fruity muffins and your children's pic. Gina-Your citrus muffins are a "ray of sunshine"...so gorgeous and yummy! Such a rewarding cause you're doing, and your recipe and photos are divine! Delicious fruit combination and your muffins look fantastic. Great activity with your kids. I just made your pork and sausage stew and LOVED it. In fact, my whole family loved it. I made it on a snowy, freezing day it just felt warm and perfect. I hope you'll come back to The Executive Mom and link up another one! These muffins make me smile! And so does the cute photo of your girls!! What a great cause! These muffins look so sunny and thoroughly delicious, and your girls looked so adorable in their younger years. It's great that you've got dedicated helpers in the kitchen like them. What a delicious recipe for a fabulous cause. I love how bright and cheery these muffins are. And the addition of toasted almonds is a nice touch. The younger daughter looks just like you!! So adorable! Love the flavour combo! Bookmarked! These muffins must smell so good! Pineapples, oranges and bananas - they gotta be healthy too. What an adorable picture of your girls cooking in the kitchen as you did with you mom :) These sunny little muffins are the perfect recipe for the Frigidaire campaign. I've been meaning to visit the site and submit a kid-friendly recipe too.